Bristol City Football Club’s plans to build a new training ground have been given the go ahead. North Somerset Council planners passed approval for the club’s plan for its base in Failand, north Somerset including a 500-seat floodlit stadium. Club bosses said the development is “key to Bristol City’s future”. Following talks, a next door golf club withdrew objections based on concerns players would be at risk from stray golf balls. 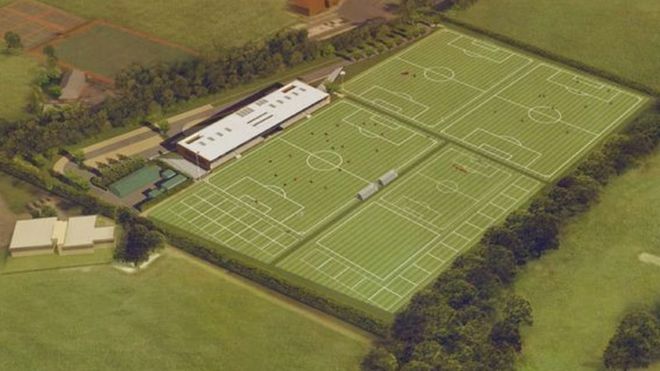 The plans include three full-size pitches, seven-a-side and goalkeeping pitches, a groundsman’s compound, 142 parking spaces and a coach drop-off site. Also a new pavilion building will house a medical centre, gym, sports science facility, changing rooms and a kitchen and dining area. Bristol City’s chief executive Mark Ashton has said the development of Failand was “key to Bristol City’s future” and critical for getting the best out of players and developing “home-grown talent”. “This site has been the training ground for the football club for over 10 years,” he said. “This will bring our facilities into the 21st century and provide the football club’s academy and first team with an elite performance environment. The 14-acre site is surrounded by other sports clubs, including Bristol Cricket Club, Firebrand Hockey Club, Bristol Grammar School playing fields – and Long Ashton Golf Club. Be the first to comment on "Bristol City’s training ground plan approved by council"